Aging infrastructure, including streets, is a nationwide problem. Street conditions have been a priority for elected officials and residents for over a decade, with no easy and no single solution. 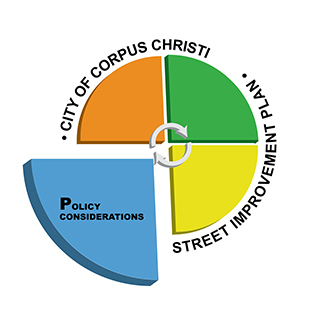 The City of Corpus Christi is in the process of implementing a multi-faceted street improvement plan to address the condition of our streets. The Street Improvement Plan (SIP) was created in 2012 to address the current and future condition of city streets. 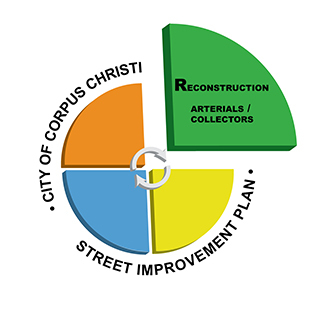 The four part pie-chart logo reflects the City's strategy of focusing on one aspect of street improvements at a time: maintenance, arterial & collector reconstruction, residential/local reconstruction, and policy. Progress has been made in each area. However, because taking care of streets is an ongoing effort, the SIP can never really be considered complete. Through the SIP, the City will continue to focus on street improvement. Keep up on street improvements in progress. This Plan is comprised of four strategies: Maintenance, Arterial / Collector Reconstruction, Residential / Local Reconstruction, and Policies. 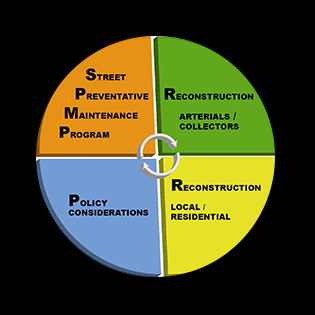 The Maintenance strategy has two parts: the Street Preventative Maintenance Program (SPMP) and the Street Maintenance Fee (SMF). The Arterial & Collector Reconstruction strategy is for larger streets that have more traffic. Projects in this category are usually paid for with voter approved Bond dollars. The Policies strategy looks to improve two important areas: street design life and street cuts. Policy changes will extend the life of new streets. The Residential / Local Reconstruction strategy addresses streets with lower traffic levels than the arterials or collectors. Most of the City's street network is made up of Local streets. 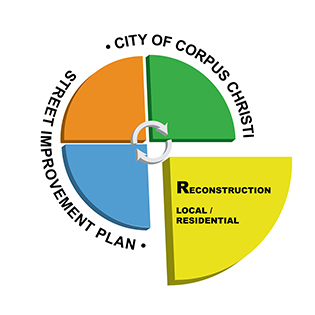 The Residential Street Rebuild Program (RSRP) is the City's program to address rebuilding streets in neighborhoods. Two Test Projects are underway to provide information for the development and execution of the RSRP including current construction costs. Additionally, residents approved an $11 Million Bond 2016 project that will start work citywide on residential street rebuilding. Seal Coat - this treatment adds a protective coating that seals minor cracks and restores the waterproof quality of the pavement. Mill & Overlay - this treatment removes the top layer of pavement that has been slightly damaged by weather and traffic ("mill") and then adds a new layer of pavement ("overlay"). Rehabilitation - a form of rebuilding streets that uses as much of the existing underlying base material as possible when conditions are right. Less expensive than full reconstruction. Reconstruction - a form of rebuilding streets that completely replaces every part of the street. Seal Coat - when a street is still in good condition so that it stays in good condition. For a thirty-year life street, the first seal coat would be done when the street is about seven years old. It would be done again when the street is about twenty-one years old. Mill & Overlay - when a street is still in pretty good shape with the major pavement damage due to weathering. For a thirty-year life street, this would be done when the street is about fifteen years old. Rehabilitation - when street pavement is in bad condition, but the underlying base and curb and gutters are in good condition. This rebuild should take place at the end of the street's design life. Reconstruction - when a street is in bad condition altogether. This rebuild should take place at the end of the street's design life.